We’re pretty sure everyone in Kansas City who draws a paycheck, from the C-suites to the intern pool, has heard the guidance that money can’t buy happiness. Rent it, perhaps. On a short-term basis. But true happiness at work is the stuff of true employee engagement, and money—no matter how good it is—will never secure full buy-in from employees the way a well-thought-out, strategic, focused workplace design and benefits plan will. That means more than a nice biweekly check and health-insurance coverage. Those are merely table stakes in the current search for talent, which is becoming an obsession with hiring managers in an era of sub-3 percent unemployment. Need proof of that? 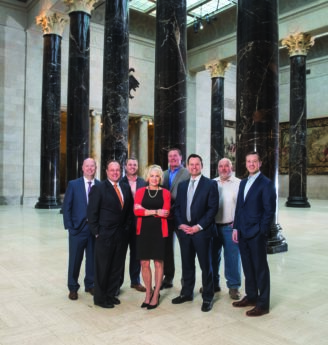 Take a look in the following pages at a dozen companies that are hugely successful in their respective sectors, highly regarded by business leaders throughout the KC area, and prized as career destinations for thousands of employees. They get top talent, and keep it. Yes, they all offer wage packages that compete favorably with other leaders in their sectors. But note the details in what these companies have added into their benefit plans, pieces that are finely tuned to align with the specific needs and wants of their staffs. An engineering firm is not a housing contractor is not an advertising agency is not a tech company. The shoes in the field or the fannies in the chairs are not interchangeable pieces. 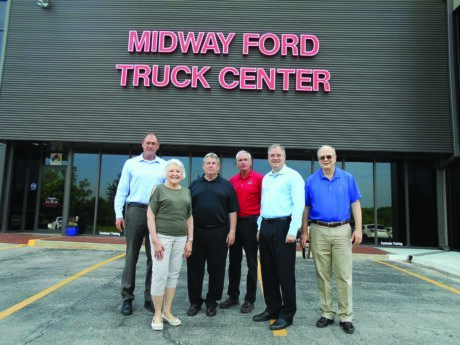 The top-tier companies in Kansas City understand that, and bring to their work forces opportunities for advancement that come through structured training programs. They go beyond the bottom tier of Maslow’s pyramid not just by offering solid compensation packages, but plans designed to address employees entire financial well-being, with robust insurance plans and retirement programs that will take care of people well beyond their working years. The bottom line is this: Companies that want to succeed need top-shelf talent to do it. They can get it in the door, but if they don’t have what it takes to keep them in place, that door is revolving, and there’s no ROI on having one in the front of your building. The common threads among these diverse honorees involve not what they pay to their staffs, but the investments they are making in those employees. Businesses that want to succeed on this level would do well to absorb the lessons these companies share freely with you in their success stories herein. With 90 offices across all 50 states and a global staff of nearly 200,000 employees, KPMG certainly has its work cut out when it comes to keeping all those folks happy. 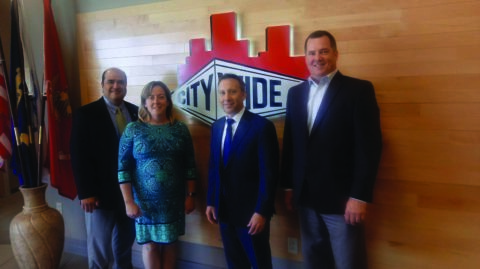 In the Kansas City office, they’ve figured out how to make it work with generous bonuses, continued education and alternative work arrangements to support their partners at every stage of their careers. Want to take a sabbatical? KPMG will work with you. 5 weeks of vacation plus paid time off for volunteering? They do that, too. But what might really pull you in is up to 18 weeks of paid leave for new moms and up to 6 weeks paid leave for other primary caregivers. That’s incredible considering the national average of maternity leave is about 10 weeks, which may or may not all be paid. And that’s not the end of it. KPMG has a New Parent Career Coaching program and a comprehensive lactation program to support nursing moms. The global aspect of the company is how they can flex some real H.R. muscle. If you get the itch to try something new, the Career Mobility Connection program lets you explore a global rotation, transfer, relocation or assignment. 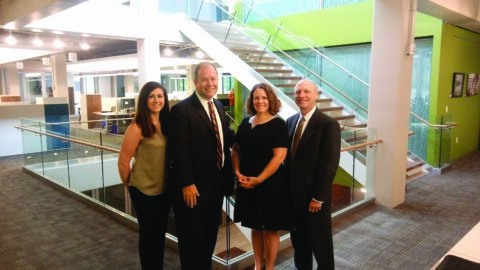 On a smaller scale, they have seven national Diversity Networks giving employees the chance to go through career-development programs, broaden professional experiences and build career-enriching relationships. As for the basics, they’re anything but. Their 401K was just upgraded to a higher match percentage, they have an employee-funded pension program, and a referral program where staff can get up to $5,000 for job referrals. If you’re just starting out you can take part in the Early Career Rewards program where you can get reimbursed up to $1,200 for things like a gym membership, food delivery or, the ultimate golden goose, student loan payments. Then after three years you can get an additional $8,000 bonus from promotion/hire to senior associate. They even take things a step further by allowing employees and teams to recognize each other, either with monetary or non-monetary awards through the Encore recognition program. Say thanks with an e-card, gift card and gifts valued up to $500. Family and gratitude are the themes throughout KPMG’s benefits model and that’s especially felt during summer time. They send out an annual summer gift like bbq or ice cream packages to their employees’ homes so they can share. And they also end Fridays at 3pm during the summer so you can get a jump on your weekend. 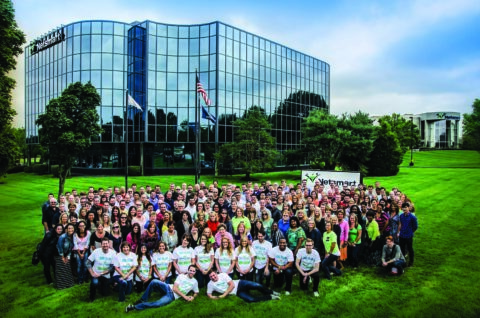 Five years ago, not long after relocating Netsmart from its previous home in New York, Mike Valentine had assembled a staff of 185 at his new headquarters in Overland Park. That figure has more than tripled since then, as the company has become the nation’s largest provider of electronic medical records in the behavioral health sector. To get everyone on board, and on the same page, Valentine and his team have embraced two key values that come up repeatedly: Communication and collaboration. “Consistency in messaging and actioning our mantra throughout everything we do is key to who we want to be,” he says. 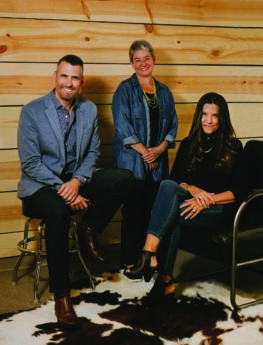 That mantra—Vision Driven, Cause Connected, Passionate about our Opportunity and Obligation—permeates decisions about workspace design, onboarding/training, performance reviews, staff accountability measures and client service. 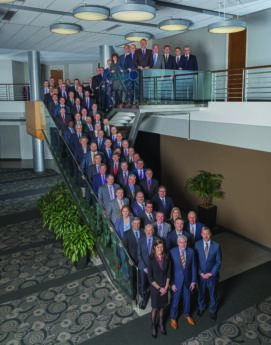 Because of the rapid growth of staff, Netsmart has embraced nomination-based leadership programs targeted for the top 2 percent of associates each year. But it pays close attention, as well, to new hires and to the development needs of staff across the enterprise, and to physical spaces that foster engagement. One of those is the Netsmart Solutionarium, which Valentine calls “a revolutionary hub of collaboration and ideation—a strategic, collaborative area.” Tech tools there, he said, help produce “innovative solutions to reshape systems of care and drive the clinical agenda for quality, recovery-focused care.” Open and private areas throughout the building allow for meetings, relaxation and work, and to encourage person-to-person interaction, very few offices exist. 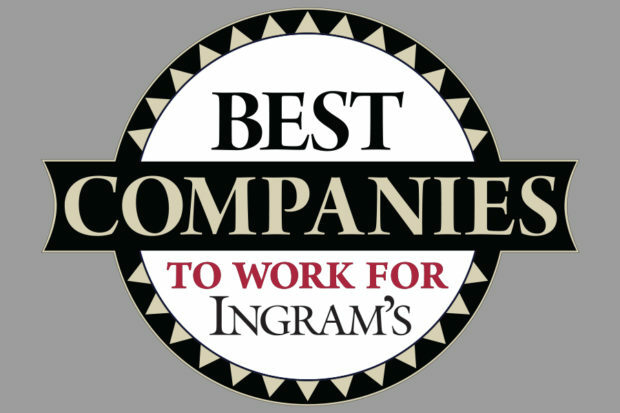 The company offers competitive compensation and a benefits package that includes medical, dental and vision insurance, plus supplemental life, disability and AD&D coverage. The 401(k) plan kicks in a 50 percent company match on the first 6 percent of an associate’s contribution, and both flexible-spending and health-savings accounts are available. Among its benefit offerings, Valentine said, “we believe our signature is ‘choice and flexibility’ in our benefits offerings, allowing associates to elect as much or as little coverage to suit their individual and family needs.” And the ample schedule for paid time off includes service days for giving back to the community, personal use and standard holidays. In the quest for talent, that line-up will only improve. “Maintaining a variety of benefits will not present a challenge going forward and we anticipate to only add to the offerings,” Valentine says. 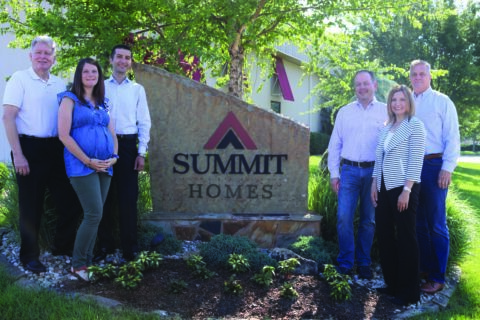 A lot has happened at Summit Homes since the last time the company appeared in these pages as one of the region’s Best Companies to Work For, in 2012, the company was acquired by Clayton Homes, a subsidiary of Berkshire Hathaway. A testament to their Best Companies status: There was no employee turnover because of that acquisition. Zero. Perhaps because being purchased by a multi-billion dollar company really does have its benefits, like health benefits. Summit now offers short and long-term disability, something it couldn’t do as a smaller, locally owned company. Pay went from bi-weekly to weekly to help employees better manage cash flow, you can get 12 weeks paid time off after giving birth and the company’s 401(k) match went from 3 to 4 percent. Here’s where it gets interesting: They have in-office massages available on Thursday afternoons. Naturally, they take those goodies one step further. “A big local change we made in the past year is flexible schedule,” says President Fred Delibero. “Team members may work any hours that fit their schedule so long as they’re here core hours during the day. Another neat program we recently introduced is ‘in the zone’ Wednesday afternoons where team members can focus on completing projects without phone interruptions or interruptions from other team members.” But wait, it gets better. Summit Homes doesn’t allow company-wide meetings on Thursdays or Fridays “so that team members can focus on their tasks and spend more time in the field ensuring we’re utilizing the best practices and delivering the best product to our homeowners.” That flexible time is what Delibero sees as one of the most important changes to make employees feel valuable and important. He also notes the monthly lunches where team members can recognize each other through the YFA! (You’re Freaking Awesome!) awards. But the best thing he says they’ve done, is the simplest. “Our leadership team has worked hard to learn how to connect with team members personally and professionally, and to take time to recognize achievement and just simply say ‘I appreciate you’ more often to team members who are a vital part of Summit’s success.” What he leaves out there, is that Delibero carves out 15 minutes of every week to craft and send hand-written notes to his staff to go along with the personally signed birthday and anniversary cards to everyone on the team.